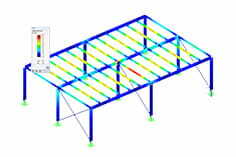 When trying to calculate a truss the error message 1677 "Rod no. 75: Invalid kink length coefficients. Check this in Table 1.7 or in a related table. " 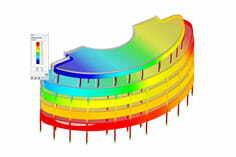 Since RSTAB8 / RFEM5, the buckling length coefficients can be specified as soon as they are entered, which are then adopted when the additional modules are started. If the above message appears, the entry of the coefficients in an old version has been set to 0 and due to this incomplete bar definition, a calculation in the main program is not possible. To fix this, a value> 0 must be entered. If the buckling length coefficients still do not play a role, the entire structure should be selected, the "Edit Bar" dialog box should be opened and the coefficients should be reset to the default value of 1.0 in the "Buckling Lengths" tab.